The award-winning Dreambaby Indoor/Outdoor Retractable Gate is a versatile gate that can be used inside and outdoors as it's made from a UV treated durable mesh to keep it from fading in the sun. The gate is hardware mounted and comes with two sets of mounting brackets for easy use in more than one place. It can be unclipped from one set of brackets and easily relocated to the other set of brackets. Fits narrow to wider openings up to 55inch and is suitable for doorways, hallways and stairs. The loud sound is to alert parents that the gate is being opened. For silent opening, you must turn the top knob on the gate while you retract the gate with your other hand. 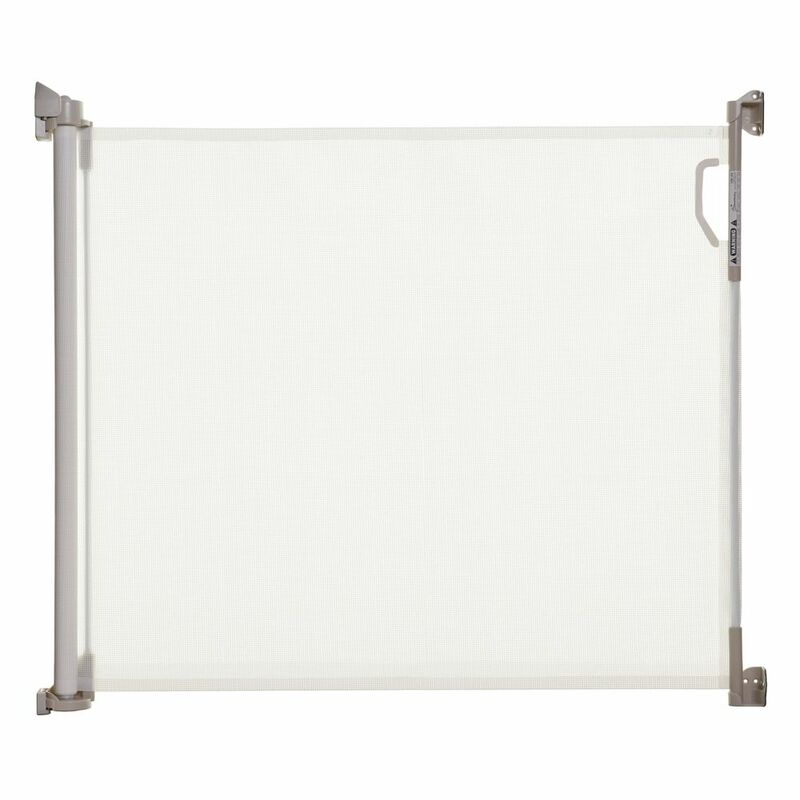 OPENS 55 inch WIDE: Standing 32 inch tall and extending to 55 inch wide, it retracts out of the way when not in use. The Dreambaby Chelsea Xtra Wide Hallway Auto-Close Metal Baby Gate combines safety and convenience in one fantastic package. Great for every home, this pressure-mounted gate features one of the widest and most sturdy single-piece construction gates that is easy to install with no screws or drilling required. The Dreambaby Chelsea gate is easy to install, allows for one-handed operation, a door that opens in both directions and closes automatically from any distance, every time. For added security, the EZY-Check indicator shows the gate is securely locked with just a quick glance and the double action locking feature helps keep even the most curious toddlers at bay. Smart Stay-Open feature is perfect for when you need to move freely through the gate. Just swing the door in the stay-open position and it will stay wide open until you choose to close it. Indoor/Outdoor Retractable Gate - White The award-winning Dreambaby Indoor/Outdoor Retractable Gate is a versatile gate that can be used inside and outdoors as it's made from a UV treated durable mesh to keep it from fading in the sun. The gate is hardware mounted and comes with two sets of mounting brackets for easy use in more than one place. It can be unclipped from one set of brackets and easily relocated to the other set of brackets. Fits narrow to wider openings up to 55inch and is suitable for doorways, hallways and stairs. The loud sound is to alert parents that the gate is being opened. For silent opening, you must turn the top knob on the gate while you retract the gate with your other hand. Indoor/Outdoor Retractable Gate - White is rated 4.3 out of 5 by 40. Rated 4 out of 5 by James from FAIRLY EASY TO INSTALL, WORKS WELL SO FAR.... FAIRLY EASY TO INSTALL, WORKS WELL SO FAR. Rated 3 out of 5 by chrisejg from If the intent is to use for dogs, and you have a small dog, be careful with your consideration of... If the intent is to use for dogs, and you have a small dog, be careful with your consideration of this product. I set it up on my deck and less than 10 minutes later my older, really calm Yorkie pushed his way underneath it and was out of the yard. I had it mounted with the bottom only 1" off the deck, but the material is easy to push up. May be okay with bigger dogs (which I also have), but for a 5# Yorkie......not so much. Otherwise it is a very nice unit and likely okay for kids.